How are things in your dungeon? Over here we have bloated imps lounging in various degrees of distress, gorged ragged on chocolate and shame. Not to worry though! We’ll soon have them whipped back into shape and working feverishly on the next edition of the Gamebook Authoring Tool. A couple of nice changes in the new version: we have ramped up the beautification of the flowchart and will have a few new export options for you also. The outline panel is now better integrated into your workflow and empty sections are now handled better. Wanna use empty section 23 for this killer paragraph where your protagonist hits the orc nudist beach? Yeah, now you can that. Just don’t forget your sun cream (and bleach to clean your eyeballs after the hideous images you burn into them). Good things happening in the gamebook community right now. We have Stuart Lloyd doing the April A-Z, an exciting collection of interviews with some of the most interesting gamebook authors writing at the moment. We also have interviews with illustrators, reviewers and software developers. 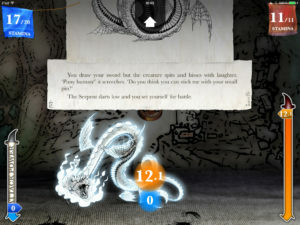 On the release horizon this month is Sorcery 3 for iPad and Android, the one with all those snake things to kill. As I remember it, it’s also probably one of the most difficult gamebooks in the universe. That appears on April 23rd, St George’s day, so if you tire of slaying dragons go and ruin some serpents instead. The Gamebook Authoring Tool 1.10 will be out later this month. ← GBAT 1.9 is released!